It first appeared on the UNICEF website. The Gujarat state report in early 2013, after a few lines of paying homage to the state's growing economy, read: "Gujarat has more miles to cover in ensuring that the economic growth translates into improved human development." Soon after in September 2013, a panel headed by Raghuram Rajan brought out a report that busted the Gujarat myth further by classifying it as a "less developed state". "The state's performance is poor when it comes to key yardsticks on which the report is based like education, health, household amenities, poverty rate, female literacy, development of scheduled castes-scheduled tribe population and connectivity," it said. Now India's Census report's Sample Registration System-Baseline Survey 2014 reveals that Gujarat fares below India's overall average when it comes to girls going to school. The survey analysed 21 major states and Gujarat ranked 20th with 73.4% of girls attending school, just a notch above Rajasthan with 72.1%. According to the survey, around 26.6% of girls in the age group of 15-17 years in Gujarat have either dropped out or have never been to school. That means 26.6% of girls in the state have not reached 10th grade. The all-India average of girls attending school is 83.8%. Gujarat falls below the national average by about 10%. Gujarat is ranked among the bottom five states even when it comes to education of girls in the age group of 10-14 years. Data reveals that overall 73.5% of girls in the state are literate. But of these, around 59% have not studied beyond class X, and only 14.8% have completed class XII. According to the Times of India when data for this report was gathered, the programme to improve girl child enrollment in Gujarat schools had been in operation for more than a decade already. As part of the annual 'Kanya Kelavni' program and 'Shala Praveshotsav', ministers and government officials fan out in rural areas to ensure children's enrollment. In 2006-2007, 44.5% of women were enrolled into school. In 2010-11 that number dropped to 40%. "First, the problem of drop outs are starkest amongst tribal communities, Muslims and Scheduled Tribes who live away from the mainland," says Nafees. In the five areas mostly populated by the Scheduled Tribes, Kutchh. Tapi, Chota Udaipur, Panchmal, Banaskatha, only local languages are spoken which are starkly different from Gujarati. These communities speak Dangi. Kokarni. Panchmehli and several other languages and none of them similar to Gujarati in any way. So when the teachers arrive from Ahmednagar and they teach the kids in Gujarati - nobody understands a word. But isn't this a problem for many parts of India? Nafees says that the problem is most prominent in Gujarat because the native languages have no similarity to Gujarati. "In Uttar Pradesh, Audi and Bhojpuri speakers all understand Hindi. In these parts nobody understands Gujarati. So when the medium of teaching isn't correct what will they learn?" These areas are also migration prone zones where migration takes place for six months in a year. During these times the girls take care of the home while the boys go to school. So, they are technically enrolled but their learning outcome is zero. And eventually, they are forced to drop out. Nafees says the other major problem is that there is a severe dearth of teachers. 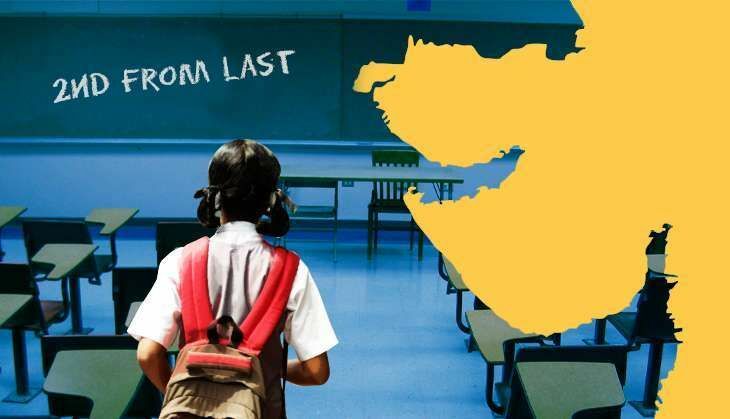 There are13 districts in the fringes of Gujarat which are seen as 'punishment postings' by qualified teachers. Crime rates are high here and parents also are afraid to send their girls to school. Nafees says that recruitment of teachers is what the state needs to look into immediately. "The burden of the crisis is on teachers. Some of these schools have a single teacher for the entire school and when the teacher is absent the kids go directly into wage labour," says Nafees. The way to get them to stick is by making their postings permanent so that there is the assurance of a job. Also, female teachers should be given preference while recruiting. It will help the girls get back in school, says Nafees.